Trading has begun in the shares of International Consolidated Airlines Group (IAG), formed by the merger of British Airways and Iberia. Shares ended their first day of London trading up 0.9% at 285 pence. British Airways and Iberia shares have now been cancelled, with the owners of these shares issued the equivalent number of new IAG shares. 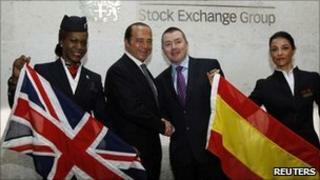 IAG shares will also trade on the Madrid, Barcelona, Bilbao and Valencia stock exchanges. IAG is now the third biggest airline in Europe by revenue, behind Lufthansa and Air France-KLM. But speaking at the London Stock Exchange this morning, IAG's chief executive Willie Walsh reaffirmed the group's desire to expand. "British Airways and Iberia are the first two airlines in IAG but they won't be the last," he said. "Our goal is for more airlines, but importantly the right airlines, to join the group." Mr Walsh said there were about a dozen airlines on their target list. Analysts suggested future growth would depend on the strength of the economic recovery, as well as IAG's ability to cut costs and offer a wider range of routes and services. The group expects to save 400m euros (£340m) a year by 2016. Others, however, said impending industrial action and higher fuel costs could affect performance this year. Goldman Sachs has a target price of 390p for IAG shares, while Credit Suisse expects them to rise to 388p, and Citi predicts a price of 375p. However others, including Panmure Gordon and Unicredit Research, don't expect shares to rise above their launch price of 282p.